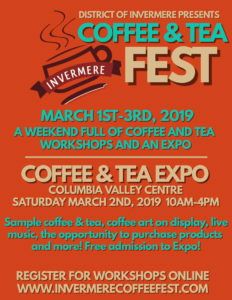 The Annual Invermere Coffee and Tea Fest returns March 1st-3rd, 2019. Over a dozen workshops lead by experts in the coffee and tea industries. On Saturday March 2nd, 2019, the Columbia Valley Centre is the place to be for the Coffee and Tea Expo! Sampling, “best brew” competition, live music, local coffee art on display, opportunities to purchase all of your favourite products and more! This Expo will run from 10am-4pm. All workshops are currently being brewed…All workshops will be listed on the Invermere Coffee & Tea Fest website, check back often! You must pre-register for all workshops in advance! Visit www.invermerecoffeefest.com for all of the exciting event information! Do you want to run a workshop or be featured in the Expo? Vendor registration is now open! Contact Cortney Pitts today! events@invermere.net or call 250-342-9281 ext. 1232.